Giant Invitations is the leading supplier of exquisite wedding invitations and stationary for brides looking for truly remarkable designs. Boasting state of the art production, completely personalized service and continuing innovation – Giant Invitations is dedicated to bringing your unique love story to life. Our passion extends far beyond manufacturing super quality designs. At the heart of our business is the dedication that we give to capturing the essence of our beloved brides and grooms. It is our unique eye for the finer details that has attracted national and global clientele from the likes of Gamble Breaux (Real Housewives of Melbourne) to global award winning recording artist and actress Vanessa Williams (Ugly Betty, Desperate Housewives). Our energetic and skilled team of young designers produce only the most creative and unique designs. Utilizing cutting edge and traditional printing techniques to provide you with a high quality result every time. Our experienced and friendly customer service team are here to provide you with all round personalised support. 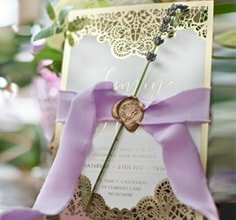 Handpicked from all over the world – we’ve found the top designers to dream and design your unique invitation.